"Right to Die" Advocate Jack Kevorkian Welcomed to Speak about "Life and Death"
The Farquhar College of Arts and Sciences Division of Social and Behavioral Sciences welcomed Jack Kevorkian, M.D., as part of the college's Distinguished Speakers Series. 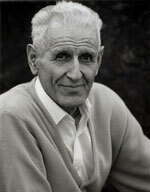 Kevorkian spoke on February 5, 2009 to more than 2,500 people in the University Center Arena. The center of increasing public attention for his activities-with the nickname "Dr. Death"-Kevorkian received both condemnation and support throughout the decade. His activities also put him in uncertain legal territory in Michigan-several murder charges in the early '90s were dropped-until 1993, when the state enacted a law that made assistance of suicide a felony. In September 1998 Kevorkian videotaped an assisted suicide in which he, not the patient, pressed the switch to initiate his device's lethal intravenous drip. Not long after the video aired on the CBS news magazine 60 Minutes, Kevorkian was arrested for first-degree murder. In March 1999 he was convicted of a lesser charge, second-degree murder, served eight years in prison, and was released in June 2007. Assisted suicide remains a highly charged focus of moral and legal debates. Do humans have a right to die that allows them to choose when and how to end their life? Should physician-assisted suicide be considered murder or moral duty? After his release from prison, Kevorkian promised to no longer assist in any more suicides. However, he continues to advocate for the decriminalization of assisted suicide and serves as a vocal proponent of a person's right to choose suicide when faced with terminal illness. Kevorkian's visit to Nova Southeastern University corresponded with the college's 2008-2009 academic theme of "Life and Death," which brought together the college's students and faculty to explore the relationship of life and death within social, scientific, legal, religious, and political contexts.